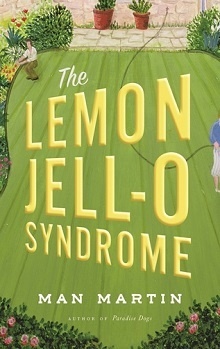 A new to me author and narrator combo is on the blog today with a quirky, twisty literary fiction that is full of laughs and outrageous imagery. Please welcome Man Martin to the blog with his story, narrated by David Aaron Baker. I’ve never read a story that features a protagonist who is so restrained and constrained by his personality. Bone King is a linguist, a major grammar nerd with social issues, a tendency to overthink words and their use, and a marriage on the rocks. It wasn’t that Bone was quirky: I appreciate quirky, but his iron-clad grip on doing things his way often fought with his ‘therapy’ and there felt as if there was an underlying need for Bone to feel set-apart. Perhaps some of this is intellectual snobbery, perhaps it truly is a touch of self-centered focus as he easily gets into navel gazing about a word, its origin or use far more frequently than one would expect. But, taking moments to laugh (and visualize his struggles with the tasks set out before him by the ‘therapist’ Arthur Limongello. See, Bone has an inability to walk through doors –taking that into a psychoanalysis point of view (the kings of navel gazing) one could think of the fear of change, new situations, even new circumstances. In Limongello-speak, his self (including self-determination and movement) are dislodging – and he must work to reattach them. Here is where the story starts to pick up in many ways: the imagery of a grown man square dancing through doorways, fighting to care about greeting new people each day or following his assignments as his mind is constantly and consistently mulling over words, his personal life, his wife and her affair with the gardener. But as things start to move in directions unknown, and Arthur Limongello’s past comes forward with a big secret and all may not be what it seems: Bone’s quandary (and the small improvements he has made in his life with this help, become a story that alternates between quirky fun and deeper thoughts about self, self-image, relating to the world and even recovering from dramatic events. Narration for this story is provided by David Aaron Baker and he had that I’m here but not here sort of impact that I expected from Bone: he’s never truly focused on just one thing and that touch of remove was clearly present in this performance. Limongello’s presence was far different in audible effect: he appeared confident, calm and knowing and just the person you’d want for therapy. Clear enunciation, easy to distinguish character voices with nuanced pace, tone and delivery, the narration kept me engaged and involved in the story. A comic novel about the stresses in a small college linguist's personal and professional life. As he loses his wife then his job, Bone King begins suffering a mysterious ailment that prevents him from going through doors. His only hope is renowned neurologist Arthur Limongello. But then renowned neurologist Arthur Limongello offers a diagnosis as peculiar as the ailment: Bone's self is starting to dislodge from his brain. The treatment is a series of therapeutic tasks; Bone must compliment a stranger each day, do good deeds without being asked, and remind himself each morning that "Today is a good day!"